While updates to Apple’s OS X, iPhone app development and Safari for Windows may be the most talked-about introductions from Steve Jobs’ WWDC keynote address, updates to Mac OS X Leopard Server include significant features for podcasters. iCal Server, based on the CalDAV open standard. that works with Leopard‚Äôs new iCal application. Podcast Producer is an end-to-end solution for encoding, publishing, and distributing podcasts. Podcast Producer is designed to simplify the process of recording content, encoding, and publishing podcasts for playback in iTunes and on iPod, iPhone, and Apple TV. The combination of Podcast Producer and Leopard’s Podcast Capture app create a client-server system for publishing podcasts. 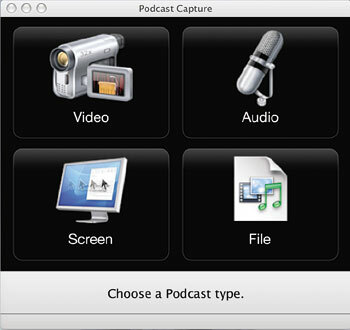 Leopard includes the new Podcast Capture application for capturing and uploading content to Podcast Producer. Podcast Capture makes it easy to capture high-quality audio and video from local and remote cameras, record screen captures, and upload existing content into Podcast Producer for encoding and redistribution. Recording a podcast is a snap. Simply launch Podcast Capture, log in to Podcast Producer, and select the type of podcast you‚Äôd like to record ‚Äî audio only, video with audio, screen capture with audio ‚Äî then click Start. When finished recording, click Stop. Or publish an existing QuickTime media file. That’s it. Podcast Capture records audio and video from a wide range of devices, including digital video cameras connected via FireWire, USB microphones, and iSight cameras. As soon as recording is completed, the file is automatically uploaded to Podcast Producer for processing. Podcast Producer utilizes the power of Xgrid to encode content into multiple formats such as H.264 and MPEG-4 for playback on a Mac, PC, iPod, iPhone, or Apple TV. Podcast Producer includes a dozen built-in workflows to automate publishing of podcasts to blogs, iTunes, iTunes U, or even multimedia-enabled cell phones over high-speed wireless networks using QuickTime Streaming Server. Workflows include the ability to archive recordings, applying custom Quartz Composer compositions with titles and watermarks, add opening and closing videos, notify the iTunes Podcast Directory of the new episode, and send out an announcement email. Podcast Producer uses Xgrid distributed processing technology for large-scale podcast productions ‚Äî encoding tasks are automatically distributed to other servers. All that is required is another server running Podcast Producer and a shared file system such as Xsan or NFS. The new podcasting features look like they will be a powerful option for producing podcasts, especially for organizations primarily targeting the iPod/iTunes platform. With the wiki server, groups can easily create and edit collaborative web pages, called wikis, with a few clicks of a mouse. The wiki server also maintains a complete history to restore previous entries and merge or compare different versions. Apple has made scheduling across different calendar programs simple with iCal Server to coordinate events, schedule meetings and track time more effectively. iCal Server uses the open CalDAV standard for integration with leading calendar programs, including iCal 3 in Leopard, Mozilla‚Äôs Sunbird and OSAF‚Äôs Chandler. In addition, Apple’s Directory makes it easy to search for people in an organization and view their contact information, picture, colleagues, groups and even see a location map. Spotlight Server takes Spotlight‚Äôs lightning-fast desktop search capability to the network server level. Designed for workgroups with shared documents, projects and files, Spotlight Server delivers search results of content stored on mounted network volumes. Content indexing is done automatically and transparently on the server so searches are always fast and up-to-date. Leopard Server‚Äôs core services, including Apache 2, MySQL 5, Postfix, Cyrus, Podcast Producer and QuickTime Streaming Server are 64-bit, allowing users to take full advantage of their 64-bit hardware‚Äôs performance and processing power and work with larger data sets. Since Leopard Server is fully 32-bit compatible, users can run 32-bit and 64-bit applications natively side-by-side. Leopard Server is also optimized to take full advantage of Intel‚Äôs latest multi-core processors. QuickTime Streaming Server 6 with support for 3GPP Release 6 bit rate adaptation for smooth streaming when delivering content to mobile phones regardless of network congestion. Mac OS X Server version 10.5 Leopard is scheduled to ship in October and will be available through the Apple Store, Apple‚Äôs retail stores and Apple Authorized Resellers for a suggested retail price of $499 (US) for a 10-client edition and $999 (US) for an unlimited-client edition. It’s about time there was an integrated solution to media production from the “desktop” as described in your article (snippet below). Apple obviously understands the consumer market- and thank god for that since usoft still focuses on business “enterprise” solutions, they couldn’t be expected to add this type of fxnality to their “desktop” even though it will eventually supercede voicemail/email in the workplace when broadly implemented. Ah, this is the kind of post I was talking about! Well done!